In this news release, the La Valle Golf Course contractor and Project Manager Jim Gangley talks about the scenic views from the new golf course under construction at La Valle in St. Kitts. 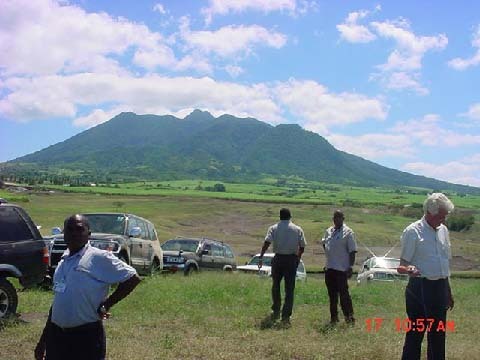 BASSETERRE, ST. KITTS, MARCH 22ND 2005 (CUOPM) - American Golf Course Contractor and Project Manager, Jim Ganley has been speaking of the fantastic views from the La Valle Championship Golf Course. Speaking at the 12th Tee, Ganley said the course when completed will rival any tournament golf course or resort anywhere in the world. Mr. Ganley said word of the La Valle Golf Course is already spreading worldwide and highly respected golf writer, Don Ross can hardly wait to come to St. Kitts to write an article when it is completed. “He (Ross) had called me from the (United) States on another situation and he had heard that I was over here and had heard through the grape vine or though the internet that the golf course here is going to be just an outstanding golf course and he was really excited about coming over and write an article on it,” said Ganley. He said La Valle is shaping up to be defined as a great golf course and could rate higher than any in the other islands. The view from the 12th tee is magnificent. “The left side of the hole is defined by the hill and you strike that and out different grasses up through there it will be absolutely beautiful. 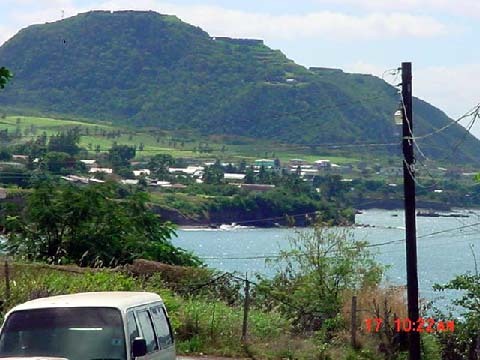 Then when we get up there by the green and you look back this way, it is even more majestic than standing here looking back it is even more majestic when you can pick up this forty foot cliff right here,” said Ganley, as he took St. Kitts and Nevis’ Prime Minister Dr. the Hon. Denzil L. Douglas and members of his Cabinet and the La Valle Greens Corporation on a complete tour of the course now under construction. He said the La Valle Golf Course which would be able to host international tournaments will drain well and will always have an opportunity to open early after heavy rain. 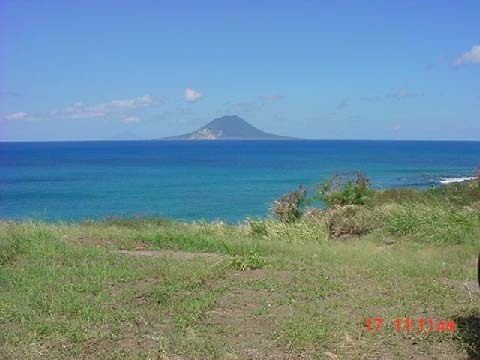 Ganley said the view from the 12th hole is also magnificent as golfers will be able to see the islands of Saba, St. Eustatius, St. Maarten and St. Barth’s and on a very clear day, Anguilla. He said the La Valle Golf Course will also be a great marketing tool to sell the resort which is to be built in the other phase. A major plus he said will be to build cottages or upscale residences close to the Club House to attract corporate outings. “So you can take the people out of the hotels, put them in the guest cottages and let them use the golf course and the facility and go ahead and eat, eat, eat and get your revenue from them eating close to the Club House on a regular basis,” said Ganley. “You have to love the island and you have to love your people. You have to have the vision to understand what can we do to promote our island and at the same time, give our people a chance for a feeling of self achievement. 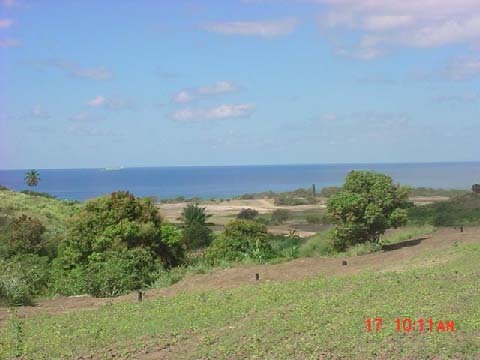 Everybody needs a chance for self achievement and this kind of project is what does it to an island. It is an asset and is going to be a creation that all can be proud of,” said Ganley. Photo # 4 La Valle - looking across Belle Tete as a tanker passes.